This section covers the installation process for the BluSynergy Salesforce app. Please be aware that you need to be licensed by BluSynergy for this product, additional monthly charges will apply. You need "Billing Administrator" security role in BluSynergy and System Administrator profile in your Salesforce organization where you will be installing the BluSynergy application for Salesforce. After logging into salesforce.com, click on the link below to begin the installation process. In the next step you are prompted for the Security Level. Select Grant Access to all Users and click Next to continue. If you wish to give only specific users access to the billing and payment information, then you may create a Salesforce Profile with the appropriate permissions (please review the Salesforce documentation on how to configure this). You may also choose to use Salesforce Permission Sets. Once the package is installed, a confirmation message similar to the one in the figure below will appear. You may click the "View Components" button to see the custom objects created so that you can decide on permissions and security controls. This security related step is to instruct your Salesforce instance that you permit access to the BluSynergy applications. "yourcompany" will typically be the short name assigned to your company. "blubilling.com" may change depending on the product (eBill vs BluBilling) and production vs staging. Contact support@blusynergy.com if you do not know your site url. The following screen shows the Remote Site after it has been created. This step directs the mode for BluSynery to communicate with your Salesforce instance. and configure as appropriate for your organization. 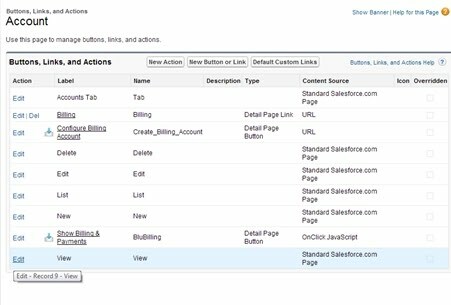 Salesforce Integration Mode - this controls the level of functionality/integration enabled. Please ensure that you are contractually licensed for the appropriate functionality. 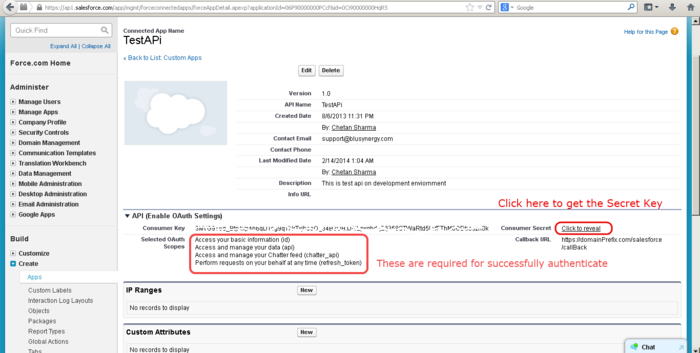 Enable Outbound Notifications - in this context "outbound" refers to API calls made from BluSynergy to Salesforce. This option is required if you wish to have native Invoice and Payment objects populated inside Salesforce as well as custom fields added to standard objects (like the Current Balance and Billing Status fields on the Account object). 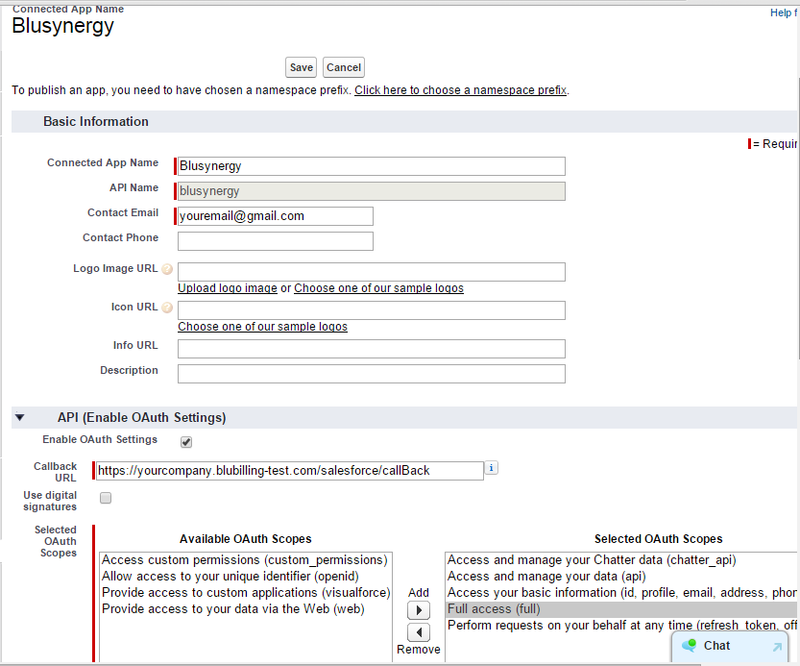 Enable Inbound Access - in this context "inbound" refers to API calls made from Salesforce to BluSynergy. This option is required if you wish to have access to the "Show Billing and Payments" functionality inside Salesforce. Both - This combines both the above capabilities. Disabled - use this option to temporarily disable integration while performing large data loads, etc. Inbound User Name - This is required if "Inbound Access" or "Both" are selected. 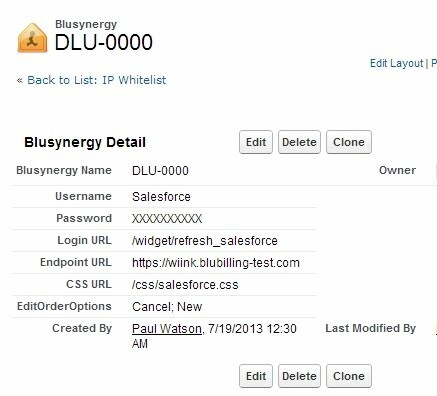 Populate this if you wish to create a BluSynergy login dedicated for Salesforce API access. Inbound Password - the password for the above login. Use at least 1 upper and lower case alphabet plus at least one number. Enable Chatter Posts - If you enable this checkbox, then a Chatter post will be published to each Account when financial activity occurs (e.g., an invoice is generated or payment is posted). Enable Salesforce Production - leave unchecked on Sandbox and Developer instances and checked on Production instances. Make sure you are able to save your settings successfully. Note that creating the username and password on the above screen is equivalent to going to the [System >> Staff Members] screen and creating a User with the "Web Service Programmatic API Access" security role. 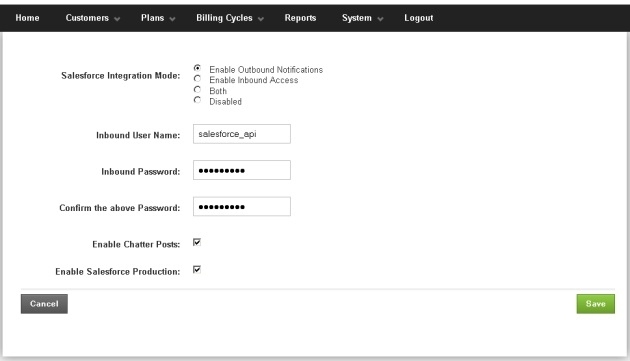 After you configure your Remote Site (for outbound access from Salesforce to BluSynergy), you now need to configure inbound access (from BluSynergy to Salesforce) by creating a "Connected App". You must perform this action while logged into Salesforce as the user under whose security context you want the BluSynergy API to operate. This implies that all Invoices, Payments, etc will be owned by this Salesforce user, and from a security standpoint, this is the only user that must be given read-write access to the BluSynergy custom objects like Invoice, Payment, etc. Go to Apps page by clicking on the link in left menu as shown in the image below. Then click on "New" Button to start creating a Connected App. Now obtain the Consumer Key and Consumer Secret which will be used later to authorize the app. If you're upgrading from an older version, you may already have an entry as seen in Fig 7.2b below (in which case you may simply click "Edit"), else use the "New" button to create a new entry as seen in Fig. 7.2a below. Fig. 7.2a. Configuring the BluSynergy parameters for the first time. Fig 7.3. below shows the various options available for the connector. 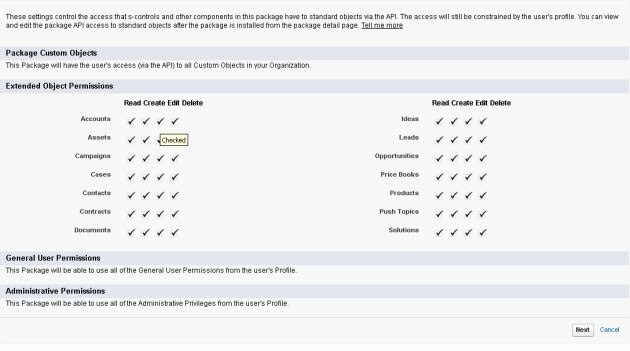 Note that these settings apply to all Salesforce users that have authorization to view the connector. Show Navigation Bar If true, then the connector will show the navigation menus for "Statements", "Payments" and "Add a Payment Method". If false, then limited hyperlinks will be available to view the list of invoices or payments. Allow Payments If false, then the user will not be able to make a payment towards any outstanding invoices. Allow Profile Edit If false, then the user will not be able to change the billing contact information. Note that this billing contact information is updated in the BluSynergy system only. Edit Order Options Can be one or more of these values Cancel,Upgrade,Downgrade,New with regard to changing or creating Orders. Note: "New" implies the creation of new orders via the Salesforce.com connector. This option is only recommended for very simple Plans (where the amount is entered in the Plan/Charges and only the Quantity needs to be entered during order capture.) It is specifically not supported for more complex Plan/Charge configurations such as "Tiered pricing", "Amount Entered at Order Placement", etc. Fig 7.3. Configuration options for the connector. After you save the above settings, go back to the previous screen and click on the link "Configure Inbound Integration". 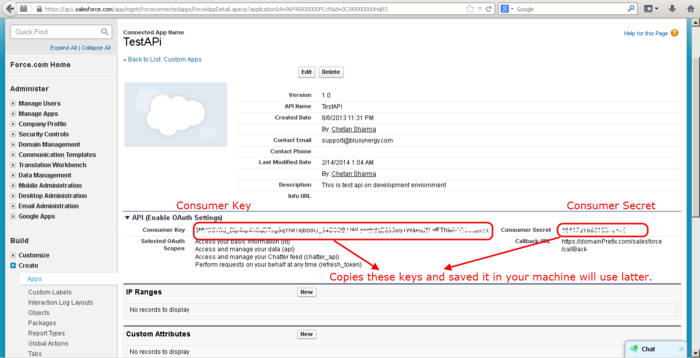 Enter the Salesforce Consumer Key and Salesforce Consumer Secret obtained from Step 5. Click on "Verify" Button to complete the authorization process. Notes: To make verification successful, you'll need to authorize the app in your organization, your profile, or your user. To authorize all users in the org, you can go to Setup > Manage Apps > Connected Apps, edit app, and set Permitted Users to "All users may self-authorize." To authorize usage just for your user profile (e.g. System Administrators), go to the same area, but click on the label of the app (BluSynergy), then add your profile to the list. You could also add a permission set to the list, then add the permission set to your user account. This will enable access just for you. After successful verification you will be asked for permission to allow BluSynergy's requests. Click on "Allow". You will be redirected to Thank you page. 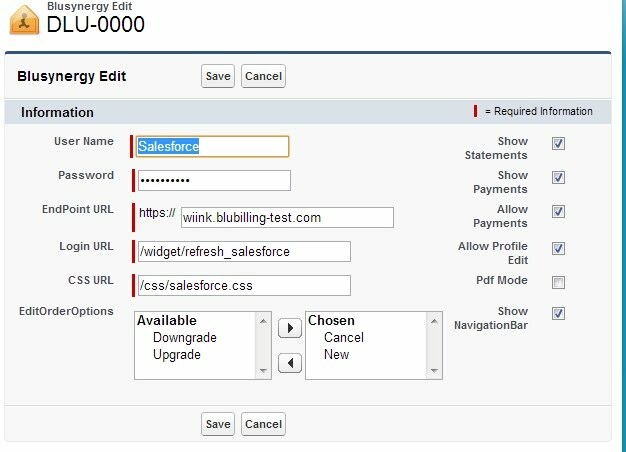 Then the typical cause is that the callback URL in In step #6 Create a "Connected App" in Saleforce does not tally with the endpoint URL in fig 7.3 above. Option 1 - Assign the BluSynergy Account page layout that provides the appropriate buttons, links, fields, etc. This option is suitable if you have not customized your Salesforce Account page. This is accessed via [AppSetup >> Customize >> Account >> Page Layouts >> Page Layout Assignment >> Edit the Assignment] screen. Option 2 - On the other hand, if you have customized your Salesforce Account page, then you may wish to control the placement and availability of various BluSynergy fields and buttons on your Salesforce Account webpage. 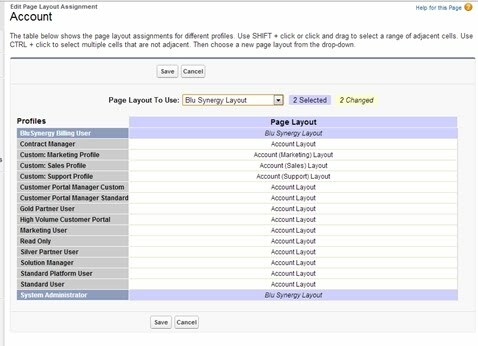 Contact BluSynergy support for this option or have your Salesforce administrator customize the screen layout. This is done by going to [App Setup >> Customize >> Accounts >> Page Layouts] and dragging and dropping various "fields" and "buttons" on the screen template. fig 8.4 dragging fields and buttons onto account page. fig 8.5 account page with new fields added. 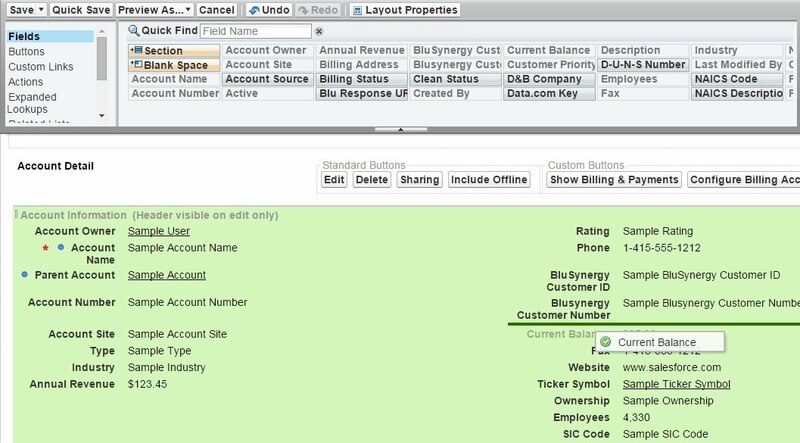 There needs to be a single field in your Salesforce Account object that maps to the BluSynergy Customer Account Number. 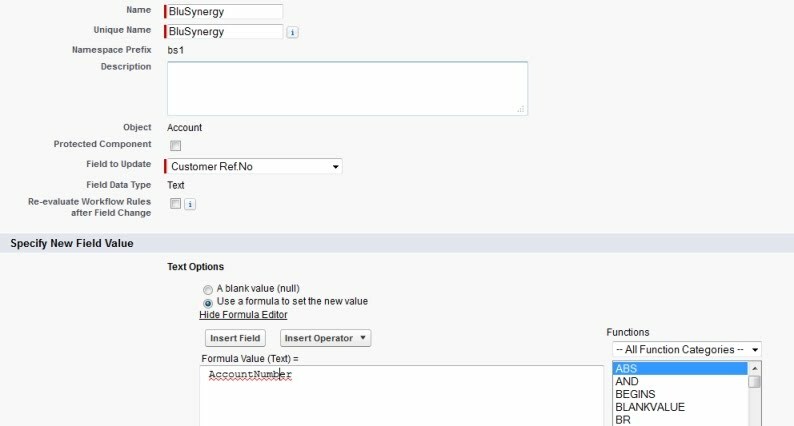 A workflow is utilized to copy this user defined field into the "BluSynergy Customer No" field in the Salesforce Account object. This field is automatically created by the connector during installation. Enter the name and unique name the select the field to be updates as “BluSynergy Customer No” and then check the radio button “Use a formula to set the new value”. 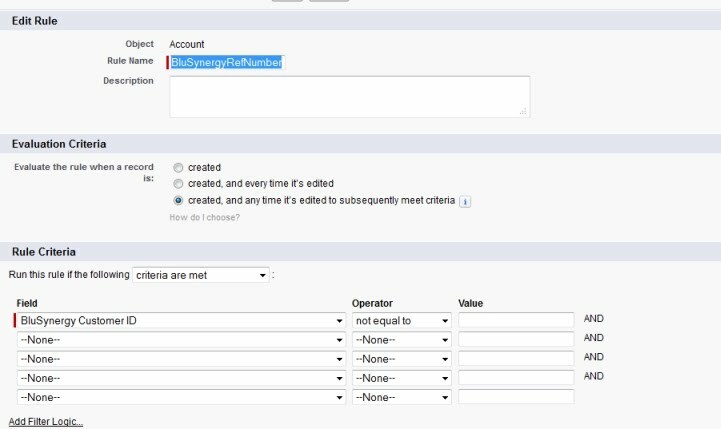 Then enter the field name of your Salesforce Account object that you wish to map to the BluSynergy Customer No (it is "Account Number" in Fig 7.2 below but you could map it to any field of your choice). Finally you need to verify that this is working by creating a new Account, and assigning a value to your chosen field. On saving the account, the "BluSynergy Customer No" field should be updated to the same value as well. Once you add 'field updates', it will be displayed in the Workflow field updates table. If you have existing "Customers" in BluSynergy or "Accounts" in Salesforce that need to be mapped, then you will need to perform a data synchronization so that the system identifiers from each system is cross populated in the other system. Contact professional services for this task. Go to [Setup >> Create >> Tabs >> Custom Object Tabs(section) >> New >> Select Object and Style >> Next >> Add to profiles-> Next->Save. Select the object and create new tab. Click on "Next" and finish creating custom tabs. This concludes the setup and configuration process.